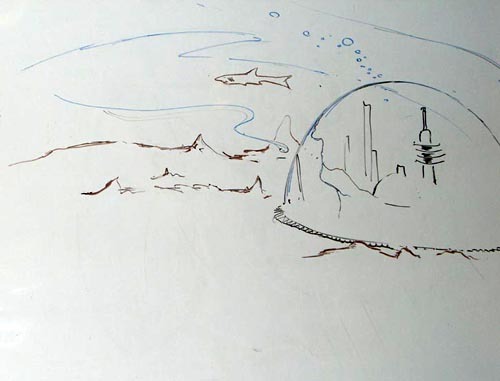 The submerged city under a dome of a force field. Drawing by R. Cat Conrad. 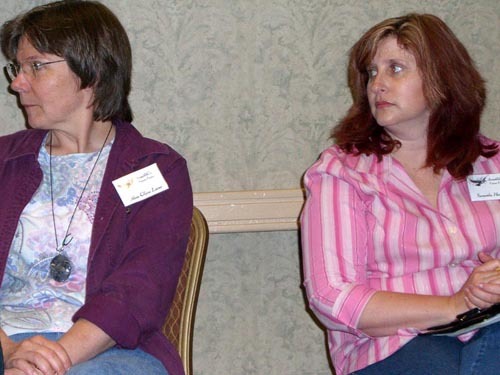 More pictures from ArmadilloCon 2007 can be found in my photo gallery. Its inhabitants may have evolved into aquatic species. It's not impossible, says Rachel Caine: iguanas in the Galapagos islands have evolved to be able to stay submerged underwater much longer than other iguanas, so that they could eat algae on the ocean floor. Or there may be two species. One is the same old human race, and it continues to live on dry land; the other is an aquatic species that evolved from humans. In this kind of setup it is very tempting to throw a Romeo-and-Juliet interspecies romance angle into the story, says Mikal Trimm. The plot-driving conflict may also be prompted by catastrophic natural events. Perhaps an asteroid hits the city, destroying some of the underwater habitats, starting a fight for resources (suggested by a guy in the audience). Or it doesn't have to be an earthquake, it can be something as simple as the change in the water currents (Mikal Trimm). Or the water may become polluted, ruining the life conditions of the aquatic species. 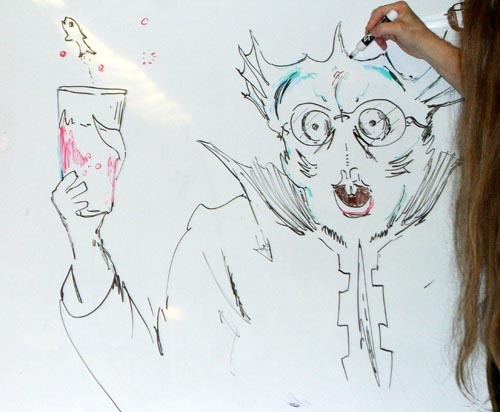 The panelists call this possibility "red tide", and it makes its way into R. Cat Conrad's drawing (see picture). A portrait of the aquatic species by R. Cat Conrad. The red liquid in the glass is symbolic of the "red tide" -- polluted water that spells disaster to the aquatic species. The fish is trying to jump out because the water is so unlivable. More pictures from ArmadilloCon 2007 can be found in my photo gallery. In any case, if you are hanging by a thread to a way of life that's slipping away, you are going to be fearful, resentful and close-minded. So the people "above" are going to resist any advancements that the aquatic people can provide, says Deborah Chester. The land people live in a religious, existential fear, that the water is going to keep rising, and the dry land is going to get smaller (Alexis Glynn Latner). They may have a religion with a savior who can live equally in both worlds (Mikal Trimm). Alexis Glynn Latner (left) and Samantha Henderson. More pictures from ArmadilloCon 2007 can be found in my photo gallery. The inhabitants of this world may have no idea how the world became this way. It's a mystery where the two races came from. But since the land-dwelling race, being closer to their common predecessor, looks like the gods and saints in the old religious pictures, they consider themselves superior (Samantha Henderson). The aquatic race may aspire to one day become more like the land-dwelling race, not realizing that they are the more advanced ones (Mikal Trimm). Or people may be worshipping water itself, especially fresh water. That in itself can drive the conflict, as we mentioned above: creating fresh water artificially may be perceived as heresy. If there are other submerged cities on this planet, what do their inhabitants use for transportation and long-distance communication? Dolphins, naturally. :-) Everyone who lives in the water knows how to catch a ride on a dolphin (Mikal Trimm). Rachel Caine likes an idea of marathon swimmers who carry messages. Communication may not be verbal anymore, but shifts of temperature in the water that carry the messages (Mikal Trimm). James Stoddard points out that at 4000 feet the difference between temperature and water pressure is such that you can create a tunnel of sound. A strong enough sound can travel all around the world. Rachel Caine adds that whales use that to communicate. So sound may be the best way to communicate underwater, despite other interesting possibilities. Caine also mentions that octopuses communicate with other octopuses by flashing their colors. It's a dazzling show of colors. 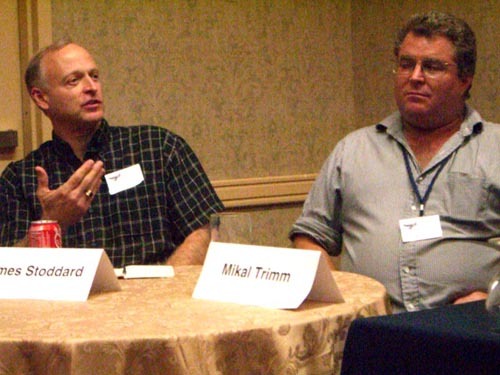 James Stoddard (left) and Mikal Trimm. More pictures from ArmadilloCon 2007 can be found in my photo gallery. Alexis Glynn Latner says the water people may need special suits, akin to space suits, to go on the surface. The colors of the suit may be the only way to communicate a person's identity. So if you wear wrong person's clothes, it can be dangerous. Maybe the colors of suits is the only way the land people can tell water people apart. So if the water people want to deceive land people, all they have to do is to put on a different person's suit (Mikal Trimm).